By a 2-1 vote, the Genoa Township Board of Trustees on Monday approved rezoning approximately 43 acres of land on Tussic Street, as well as a preliminary development plan for The Ravines at Hoover. However, most of the residents who filled the township hall were opposed to the 64-home development and vowed a referendum. The trustees’ decision rejected the recommendation of the Genoa Township Zoning Commission’s 4-0 vote against the rezoning and development plan at a meeting on March 12. The property’s owners, Benton and Katherine Benalcazar, bought the land near Hoover Reservoir in 2001. It was zoned as Rural Residential, and they sought to rezone it as a Planned Residential Development district. The Ravines at Hoover were originally going to be 67 homes, but sloping topography and zoning commission concerns lowered that number to 64. “I don’t think we should be punished because we don’t have a flat surface,” said legal counsel Jeffrey Brown, representing the applicant. It was said the development’s homes were in the $500,000 range; would be built by Romanelli and Hughes; were geared to empty-nesters although there is no deed restriction; would generate $500,000 in tax revenue for Big Walnut Local Schools; add five students to the district; have three cul-de-sacs; 51 percent open space; retain 82 percent of the trees; and have fencing on three sides. Members of the public made comments disputing some of those numbers. Benton Benalcazar, three attorneys, and architect Todd Faris fielded questions from the trustees at the three-hour meeting, which featured a public hearing where people living near the site expressed their opinions. Most said they were in favor of reasonable development, but felt the Ravines at Hoover was too much. Others were concerned with water drainage; retention ponds and safety; erosion and Hoover’s water quality; fences, trees and mounding; appearance and traffic; and the loss of wildlife. Benalcazar said the land was and is being used for farming. Attorneys said some of the barns on the site were likely not salvageable. Signs had been put up saying the land was going to be used for a pig farm. Some residents saw this as a threat, and a few said they preferred to have people instead of pigs as their neighbors. One resident suggested a third option — having the township purchase the property and establish a nature preserve. The main issue residents complained about was the housing density. 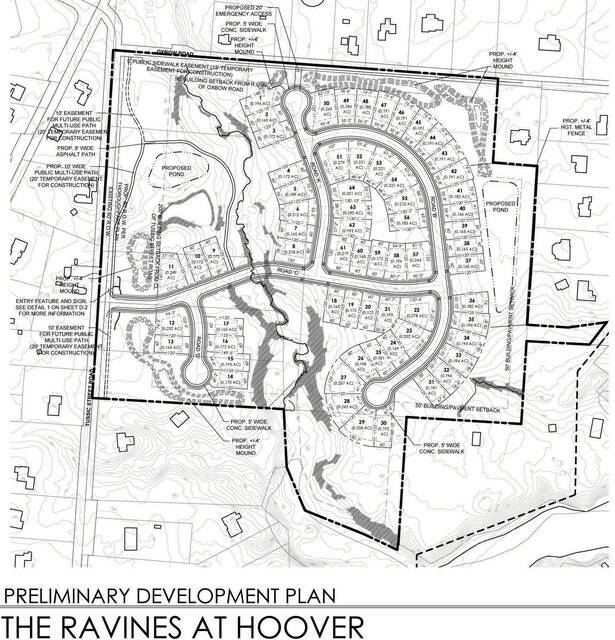 The zoning commission said the Ravines at Hoover exceeded the up to 1.35 home per acre density as stated in the township’s Comprehensive Plan for Planning Area 4. However, the township’s zoning resolution said the maximum density is up to 2.2 homes. The attorneys made the argument that the zoning resolution trumped the Comprehensive Plan, and that they were being held to a higher standard than other nearby housing developments. Trustee Chair Connie Goodman and Karl Gebhardt voted in favor, and Frank Dantonio was opposed. Each explained their vote. Residents openly questioned what was the point of having a zoning commission if their recommendations were not followed by the trustees. Gebhardt said the commission wasn’t properly doing its job properly, which included having the zoning resolution and Comprehensive Plan language in agreement. “This meeting is a sham!,” one person said as some residents angrily left while the vote was in progress. Another said, “I’m not surprised.” Some of the people signed a petition for a referendum as they left the township hall.